Hillary Clinton took the stage in white to accept the nomination to be the Democratic Presidential candidate on day four of the Democratic National Convention and the color she wore was symbolic of the history she made that evening. The color white portrays many qualities her opponent is not known to depict. White represents calm. The color also represents fairness and equality. These attributes are ones that Hillary Clinton would like people to associate with her. Additionally, suffragettes who fought for women to be able to vote, wore the color white. So the fact she is wearing white pays tribute to these women and the many women have continued to fight for equality and helped her to be the first female presidential nominee. This suit is by far the most flattering I have ever seen Hillary Clinton wear. She has struggled with her suit style, but everything about this suit worked in her favor. The cut, material and color all looked fantastic. Wearing a great fitting suit, can be critical for a candidate. People will not be caught up on your aesthetics and will be able to focus on your message. The only thing about her white suit designed by Ralph Lauren that people were caught up on, is that she looked amazing. Obviously a memo was sent to female DNC speakers to tell them about the white dress dresscode (kidding). It’s summer, it’s hot and that backdrop is hard to compete with. White was definitely the best color choice to wear on that stage. 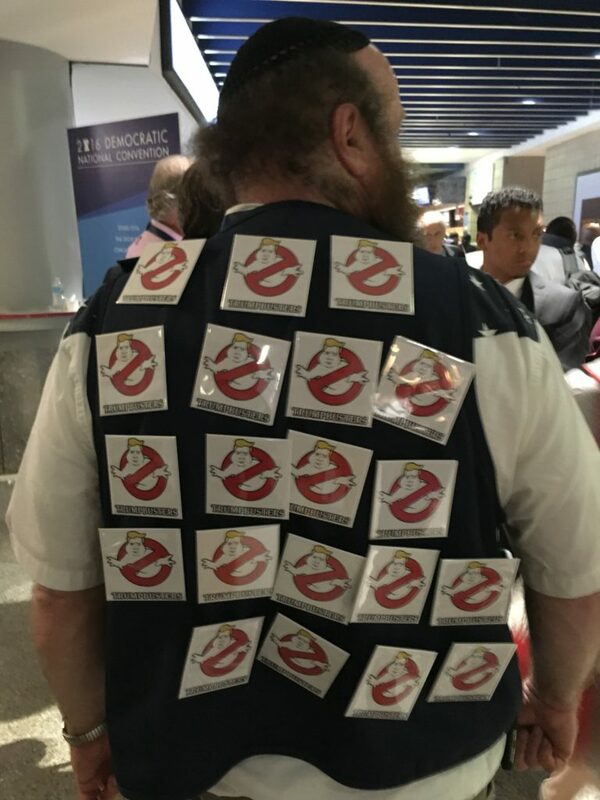 A “Hillary” delegate from Wyoming told me that he traveled to Philly with a “Bernie” delegate from Wyoming. 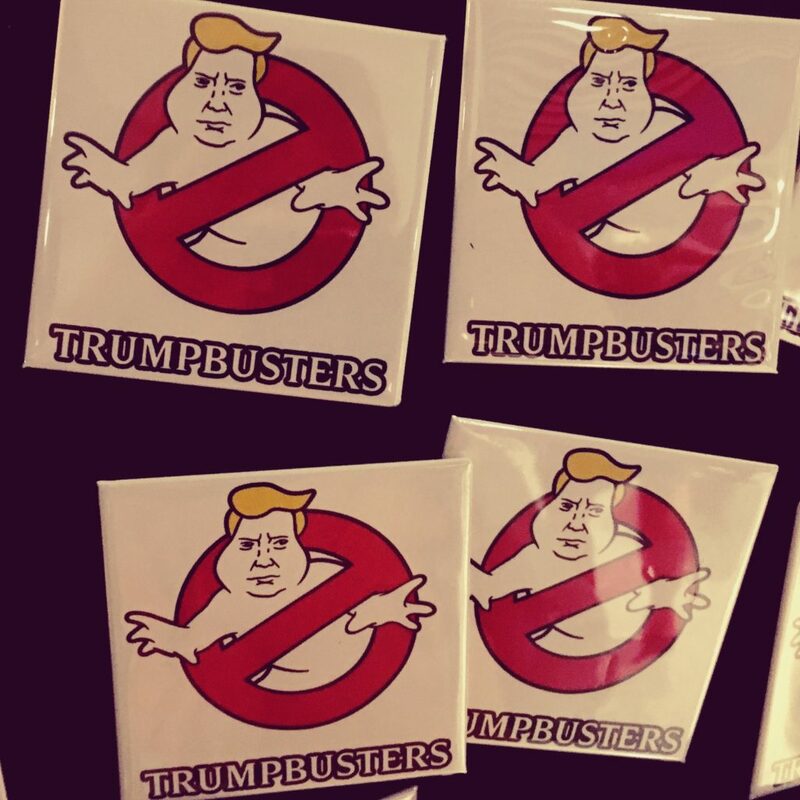 He told me that even though they support different Democrats “they will work together to bust Trump.” In honor of this mission, they created these “Trumpbuster” badges and decorated their clothing with them for the DNC. 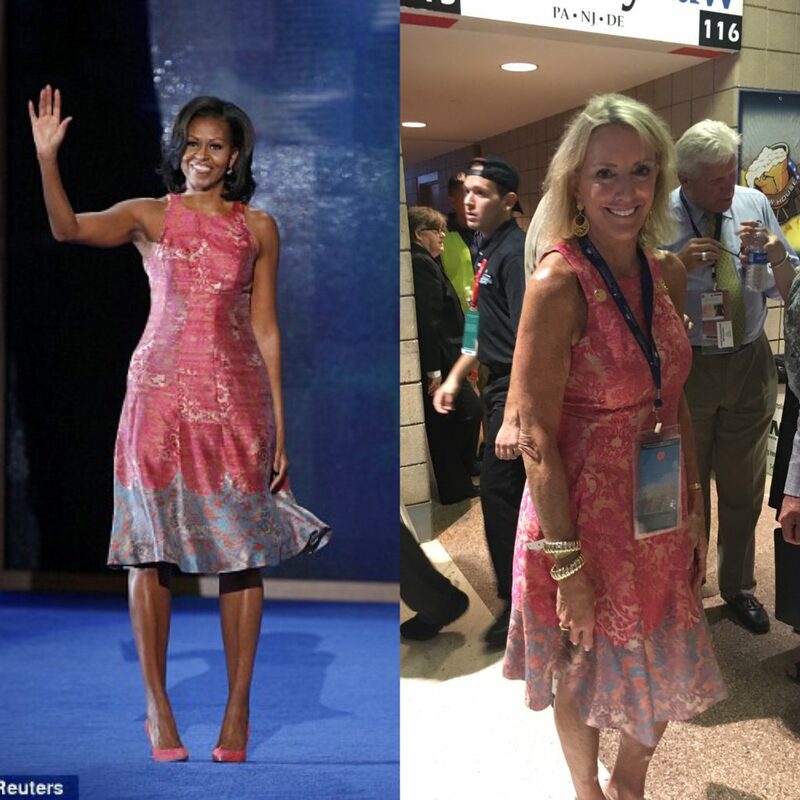 When I spotted Ambassador Elizabeth Frawley Bagley at the DNC last week wearing the same dress that First Lady Michelle Obama wore to deliver remarks at the 2012 DNC convention, it reminded me how Michelle Obama was really the first politico to sell clothing, albeit unintentionally. We all remember how Jenna Lyons was promoted for the exposure and sales that resulted from the First Lady wearing J. Crew. The First Lady has brought exposure to many designers since 2008 and has really given a substantive voice to the fashion community. The Tracy Reese dress that she wore in Charlotte to deliver a speech in 2012, is no exception. The past two weeks have been fashion heavy on the “political convention runway.” Both Melania and Ivanka Trump managed to sell out the dresses that they both wore. Ivanka even wore her own fashion line, which was a brilliant marketing play. Her brother Donald Jr. wore a tie made by the Donald Trump brand, and then at the Democratic National Convention Eva Longoria was dressed for primetime in a dress from a clothing line she designed for The Limited. I’m not surprised that fashion is front and center in politics, but it has been very interesting to watch how much of a role fashion has played at both political conventions and more notable how the fashion has influenced sales. Cowboy boots saturated the Republican National Convention, but I did see a few pairs at the Democratic National Convention. 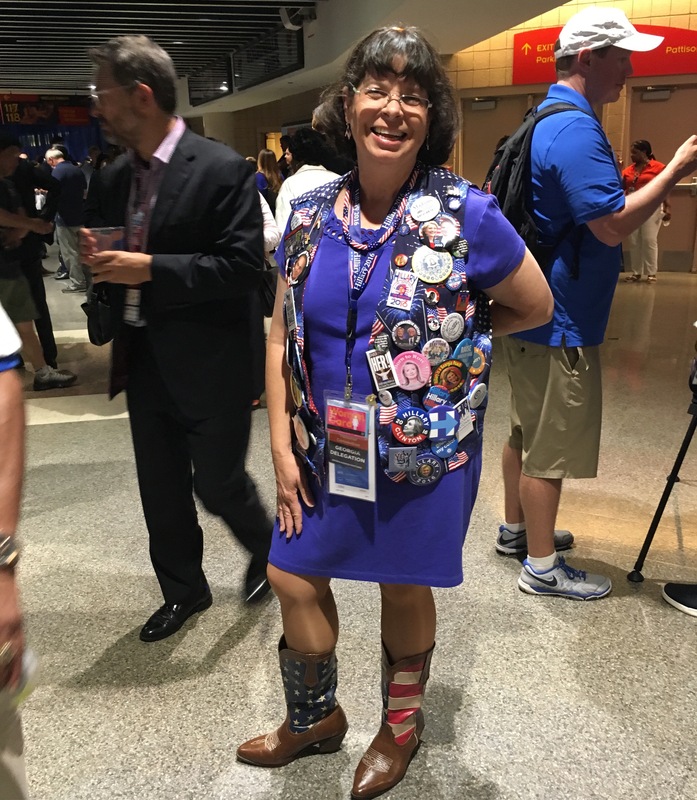 This woman is a delegate from Georgia and she told me those were her “Trump kicking boots.” Fashion and function, I like that.